What is Online 360 Degree Feedback Software? Online UK 360 Degree Feedback Software is a system in which employees receive anonymous feedback from the people who work around them. This typically includes the employee's manager, peers, and direct reports. The UK 360 Degree Feedback Software here is offered under the SaaS (Software as a Service) model, meaning that the software is web based, hosted on the Cloud and can be accessed when needed through a client or web browser. If you’re looking for similar online software like UK 360 Degree Feedback Software, consider our Attendance Tracking or Employee Monitoring Software categories. Actus 360 feedback provides a flexible and highly customisable solution for 360 or peer review driven appraisals/ development. Flexible templates, visual charts and unlimited reports. 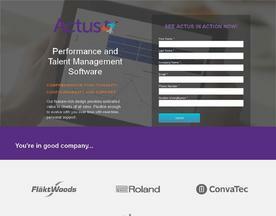 Use as part of our full performance management solution or on its own.